Hello! 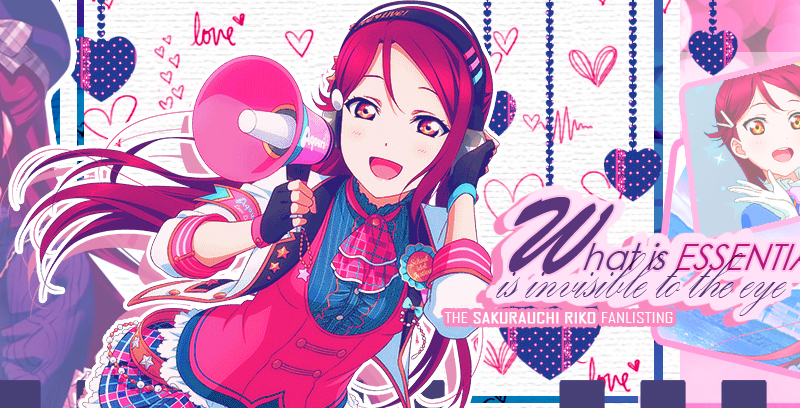 Welome to "What is Essential is Invisible to the Eye", the TAFL approved fanlisting dedicated to Sakurauchi Riko , a beautiful character from the series Love Live! Sunshine! !, created and developed by Studio Sunrise! She comes from Tokyo, but she's a simple and kind girl who only thinks about playing her piano. She's lost in her melody and the reason why she moved to Uchiura is that she lost her inspiration. She tried to follow a way to find how the sound of the sea sounds. 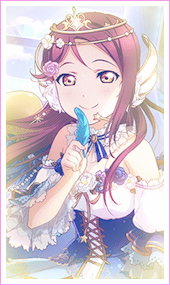 Riko searched for the voice of the ocean, and finally found it thanks to Chika-chan, the person that showed her how brialliant can be a person full of dreams and will of shine. So Riko-chan joined Aqours, Chika-chan's school idol group. She's their composer, but also the pianist who continued searching for herself in the sea of the music. I love so much how she developed. Riko-chan is absolutely the person that more than any other made me enjoy the series and Aqours. I think that her friendship with Chika-chan is one of the most beautiful ones of the series. And if there is something that Sunshine!! shows well and with a lot of touching moments is how deep and different are all the kind of friendships of these nine girls. Because everyone shines as single and together as well. About this, Riko is part of a sub-unit called Guilty Kiss, together with Mari and Yoshiko. Please, choose a link from the right to fully access the site, and if you're a fan of Riko-chan, feel free to join her fandom! Love Live! Sunshine!! ©Sunrise, all rights reserved. This is a fan-site and I don't intend to violate them. Layout & contents ©Dorothy. Images are from Zero-chan.net.